A compound from green tomatoes stimulates the growth of cultured human muscle cells and prevents and treats muscle atrophy in mice, report researchers. 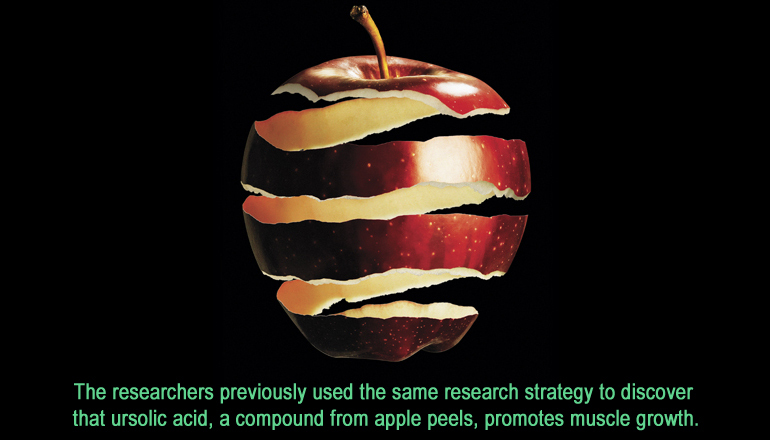 Using a screening method that previously identified a compound in apple peel as a muscle-boosting agent, scientists discovered that tomatidine is even more potent for building muscle and protecting against muscle atrophy. Muscle atrophy, or wasting, is caused by aging and a variety of illnesses and injuries, including cancer, heart failure, and orthopedic injuries, to name a few. It makes people weak and fatigued, impairs physical activity and quality of life, and predisposes people to falls and fractures. The condition affects more than 50 million Americans annually, including 30 million people over age 60, and often forces people into nursing homes or rehabilitation facilities. “Muscle atrophy causes many problems for people, their families, and the health care system in general,” says Christopher Adams, associate professor of internal medicine and molecular physiology and biophysics in the University of Iowa Carver College of Medicine. For the new study, available online in the Journal of Biological Chemistry, Adams searched for a small molecule compound that might be used to treat muscle atrophy. “That result was important because we are looking for something that can help people,” says Adams. Their next step was to add tomatidine to the diet of mice. They found that healthy mice supplemented with tomatidine grew bigger muscles, became stronger, and could exercise longer. And, most importantly, they found that tomatidine prevented and treated muscle atrophy. “Green tomatoes are safe to eat in moderation. But we don’t know how many green tomatoes a person would need to eat to get a dose of tomatidine similar to what we gave the mice. We also don’t know if such a dose of tomatidine will be safe for people, or if it will have the same effect in people as it does in mice,” Adams says. The National Institutes of Health, the Department of Veterans Affairs Biomedical Laboratory Research & Development Service, the University of Iowa Research Foundation, and the Fraternal Order of Eagles Diabetes Research Center at the University of Iowa supported the research. The University of Iowa Research Foundation has filed patent applications related to this research. Several members of the research team are inventors on these applications and hold equity in Emmyon.